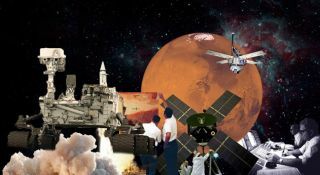 "The Changing Face of Mars," which chronicles the nearly 50 years of Red Planet exploration, premieres Jan. 23, 2012 at Caltech's Beckman Auditorium in Pasadena. NASA is unveiling a new documentary film about the history of Mars exploration today (Jan. 23) to an audience in the Los Angeles area, and there's a chance the movie could eventually get distributed nationally. "The Changing Face of Mars" premieres tonight at 8 p.m. PST at the California Institute of Technology's Beckman Auditorium in Pasadena. Admission is free, with seating on a first-come, first-served basis. The 90-minute documentary, which was produced by NASA's Jet Propulsion Laboratory (JPL), chronicles humanity's efforts to explore the Red Planet, from the first flyby in 1965 by NASA's Mariner 4 probe to the current work being done on the Martian surface by the agency's car-size Curiosity rover. Reminders of those two bookend missions will be on display at the premiere, which will feature a full-scale Curiosity replica and the historic "first image" of Mars — a hand-drawn color portrait put together in 1965 using data beamed home by Mariner 4. One aim of "The Changing Face of Mars" is to highlight and preserve the contributions of the 1960s-era pioneers, who blazed a trail to the Red Planet that engineers at NASA and other space agencies are still following today. "They didn't know how to build a spacecraft; it had never been done before. There was no one they could turn to to ask how to build a spacecraft," said writer/director/producer Blaine Baggett, who heads JPL's office of communication and education. "So I just have a tremendous respect and appreciation for those who came before, and I'm bound and determined to capture their memories and experiences so we have them, before they're lost for good," Baggett told SPACE.com. "The Changing Face of Mars" is the fourth installment in Baggett's ongoing series "Beginnings of the Space Age." None of the titles are available nationally at the moment, though Baggett said discussions about a possible deal to distribute all four are underway. Baggett hopes the series includes eight or nine films eventually. "There are four or five more films, if I can last out and they keep me here that long," he said.